While the episodes I saw weren't particularly mind blowing they were reasonably solid Batman stories in a darker tone than the previous animated series Batman, The Brave and the Bold. Batman, in particular, is a much angrier and more focused hero and is voiced extremely well by Anthony Ruivivar. The only thing that really bugged me about this version of Batman is the shape of his cowl and the extremely pointy, flared out ears - not a lot of forehead in the character design. Anyway, I happened along the DVD of the first half of Season 1, Beware the Batman - Shadows of Gotham, in my local department store and thought I'd give it a try. 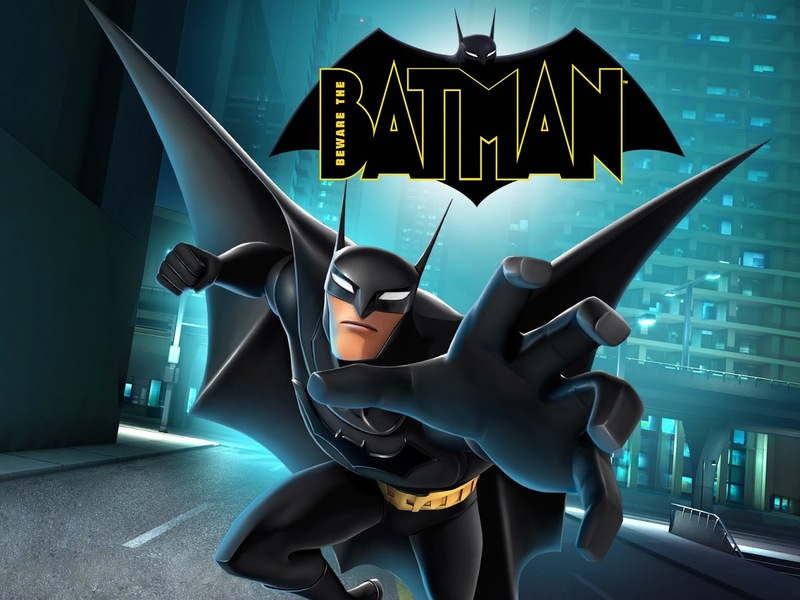 Several months later I happened to find the second half of Season 1, Beware the Batman - Dark Justice, in the same department store and bought that as well... to see how it ends. Overall I would say Beware the Batman is a very under rated series. For the most part I always found each episode engaging and the characters of Batman/Bruce Wayne are as good a version as any I've seen to date in an animated series. Also a real highlight is Kurtwood Smith as Lieutenant Gordon, who's character arc is fairly typical of modern versions of Gordon. Initially hostile towards Batman but eventually reconciles that bringing him in isn't as beneficial as just keeping an eye on things and accepting his help when necessary. Despite that his character is a standout in the series. I must admit I'm not a fan of this version of Alfred Pennyworth (JB Blanc) depicted here as an ex secret agent. There's nothing particularly wrong with it as such but for a guy in his 60's he sure can not only take a punch but really hit hard too. In an early episode you see him go toe to toe with Bruce in an apparent training exercise. Seriously, if I'm fit enough to take on Batman in my 60's I'll be one happy camper. Disappointingly this is yet another series with no Robin. Instead we get Katana (Sumalee Montano), a sword wielding spy from Alfred's past. Except for a really lame 'Clarke Kent' like disguise the character is a great addition and eventual side kick for Batman (that's not really a spoiler you can tell it'll happen from the moment she appears). My only question is how did she make it through 26 episodes without so much as a single drop of blood on her sword. I don't think any villain got so much as a scratch. The villains aren't your classic Batman rogues gallery. To be honest I've never heard of any of them other than Ra's Al Ghul (Lance Reddick) who makes a brief appearance mid season and Killer Croc (Wade Williams) who also appears in a few episodes. I wasn't a big fan of Anarchy (Wallace Langham) who is supposed to be the seasons major villain but really doesn't get enough screen time to feel like that's his role. Apparently he was chosen so as not to make this series 'another Joker story' but if they had used Joker instead I think the stories would have been stronger. Anarchy is too low key and doesn't really live up to his name. He's too calculated. Surprisingly my favorite foes were Professor Pyg (Brian George) and Mr Toad (Udo Kier). Depicted as Eco-terrorists they are quite possibly the silliest characters of the series (and I rolled my eyes when I saw them in the trailer) but the banter between Pyg and Toad and their adversaries provided some of the best humor of the series. The only other character that really caught my attention was Barbara Gordon (Tara Strong) played as an extremely young computer hacker who eventually becomes an ally of Batman as 'Oracle' (again not really a spoiler). I was hoping she'd eventually become Bat Girl. You can see that was probably the intention over the course of the series, as Katana trains her in hand to hand combat, but sadly it was probably a storyline that we would have been seen in a second series (sorry to spoil that for you but at least you're not sitting in hope like I was). Overall there were no really stand out episodes for me. Although there were a few low point episodes - anything with Metamorpho (Adam Baldwin) and Humphrey Dumpler (Matt Jones) for a start - both highly annoying characters. However most episodes were fairly strong in their storyline. Not overly complex but interesting enough to see how they play out. I was more interested in seeing how the series character arcs played out than the individual episodes stories. If you like a darker, more serious Batman and you haven't been into recent incarnations of the character in animation then this might be well worth watching. It would have been great to see a second season of the show with some of Batman's more well known villains, as I think the choice of foes is really what let the show down. They needed at least one familiar face in this 'C list' rogues gallery, if not Joker then one of the other top tier characters (of which Ra's isn't one of them despite Batman Begins). A good series for the collection and well worth a few watch throughs for Batman alone. My son is a huge fan of batman series whereas my daughter doesn’t want to watch anything other than shows by Andy Yeatman. I get to live in two different worlds at the same time. It’s quite a fun thing though. I liked reading this post because I believe, I will have a lot of more thing in common with my son and he is going to be very happy if I answer all his batman questions.